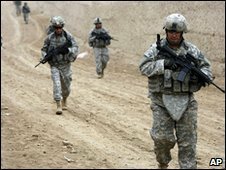 US President Barack Obama has issued new orders for the US military in Afghanistan after deciding how many more troops to send, officials say. Mr Obama told senior military leaders about his long-awaited decision on troop numbers on Sunday night, a White House spokesman said. The president is now briefing the UK, French and Russian leaders on the plan. The moves come as British Prime Minister Gordon Brown said he would send 500 more soldiers to the country. According to US media reports, Mr Obama is set to formally announce that a further 30,000 troops are to be sent to Afghanistan in a televised address on Tuesday. He has been considering a request from the US military commander in Afghanistan, Gen Stanley McChrystal, for 40,000 soldiers. Mr Obama met Secretary of State Hillary Clinton and Vice President Joe Biden on Sunday evening. He also spoke to senior staff including Secretary of Defense Robert Gates and National Security Adviser James Jones before holding a videophone conference with Gen McChrystal and Karl Eikenberry, ambassador to Afghanistan. Australian Prime Minister Kevin Rudd, who is currently visiting Washington DC, was told of the plans in person. The US currently has about 68,000 troops in Afghanistan, where foreign forces currently total more than 100,000. In his address, the president is also expected to tell the American public again why the US involvement in Afghanistan is necessary and how long the commitment is expected to last. Last week, Mr Obama said he intended to "finish the job" in Afghanistan. The White House said Mr Obama was in the process of speaking to all the key US allies in the Afghan conflict, including Italy, France, Britain and Russia. The leaders were informed of the new strategy but were not told exactly how many extra troops the US intends to despatch, the Associated Press reported. On Monday, Mr Brown said he was sending a further 500 soldiers to Afghanistan, taking the country's total deployment in the country to 10,000. He said all conditions had been met to send the extra personnel and that eight other countries had also offered additional troops. 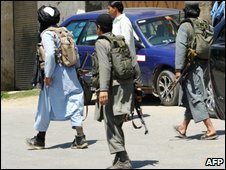 Mr Brown told parliament "the safety of people on the streets of Britain" depended on the UK taking action to address the militant threat from al-Qaeda at its source - along the Afghan/Pakistan border areas. "We should be failing in our duty if we didn't work with our allies to deal with the problem where it starts," Mr Brown told parliament. Mr Brown said the military surge would be followed by a political surge, with an enlarged and reformed Afghan police force and more effective and accountable local administration. Italian Foreign Minster Franco Frattini said on Monday that Rome was also prepared to increase its presence in Afghanistan from the current 3,200. Italy's Ansa news agency quoted Mr Frattini as saying the conflict was a test of Nato's "credibility" and that it was "clear that Italy must finish the job started with NATO and make a greater contribution if it is needed".